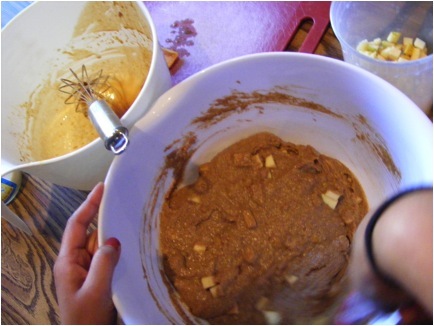 Butternut-Apple Muffins: Guest post from Linguini & Colette! – .rebel grrrl living. 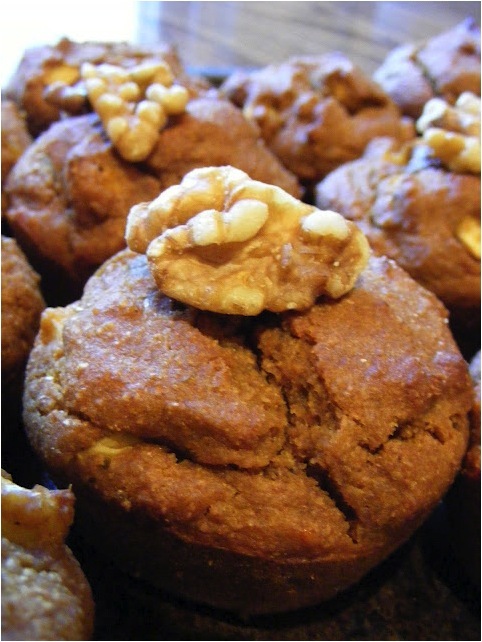 Butternut-Apple Muffins: Guest post from Linguini & Colette! Fast-forward nine years (omg, I’m old), and now we are both food bloggers, living in different cities, but staying in touch—often through our blogs! You may remember her blog, Linguini & Collette, showing up in the Friday Five, because I’m always blown away with the gorgeous pictures, amazing recipes, and her unique and eloquent voice. Enjoy this beautiful, seasonally-appropriate muffin recipe! First of all, I’m so proud of my friend Raechel and the amazing rebelgrrrl she is –in the kitchen, classroom and on the streets. Couldn’t be more excited to be a guest in this house! Last weekend, I spectated the 2012 Chicago Marathon. Inspired and humbled, I cheered on everyone I knew (and some I didn’t) who was running from the sidelines, and spent the better part of the chilly but gloriously sunny morning buried in a warm fleece, clutching hand warmer packets in my freezing palms. Yup. It was a roasted butternut squash kind of a day. 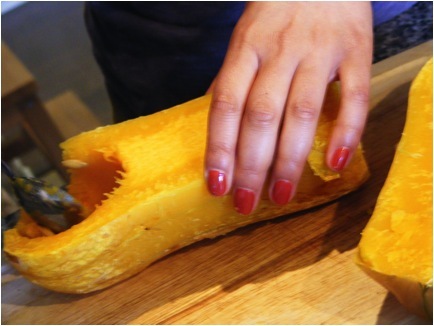 Butternut squash is a beautiful yield of the fall harvest. It’s skin-and-insides contrast contain the palette of autumnal leaves, and it roasts up warm and sweet and comforting — a worthy opponent for a brisk fall day. 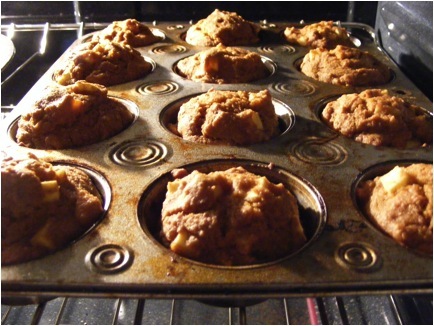 Naturally, I thought, I’ll roast the butternut squash and whip up some butternut-apple muffins….naturally. This is a legitimately healthy breakfast! I love muffins, but I find that they can often be a bit more like dessert than breakfast. Here was my attempt to reclaim the muffin as health food — packed with nutrient-dense squash and apples. 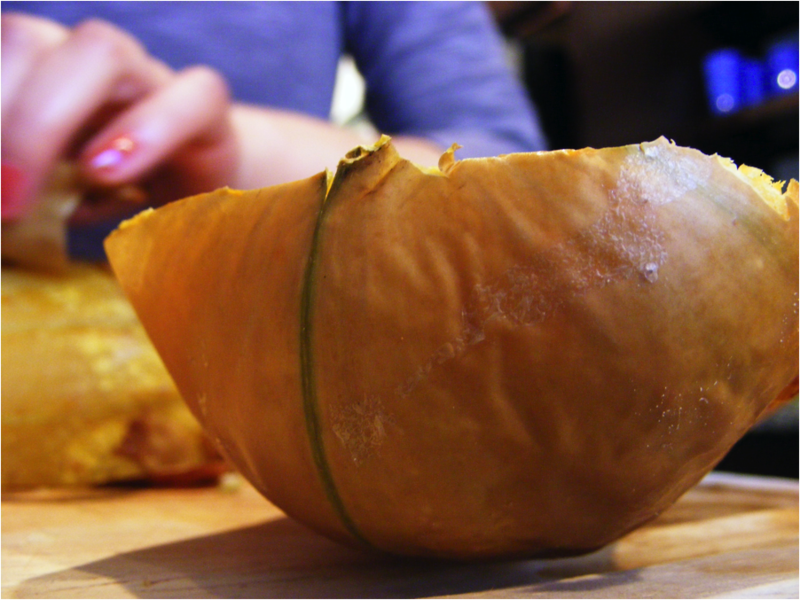 …and cutting into chunks. Doesn’t it almost look a bit translucent and glow-y? 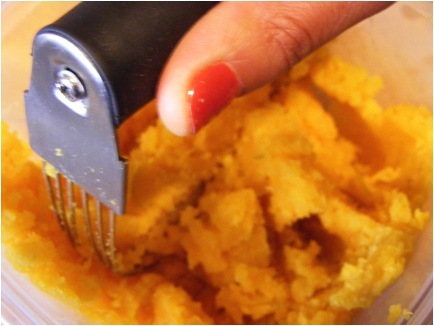 And, though it’s not pictured, I used a stick blender to purée the butternut. 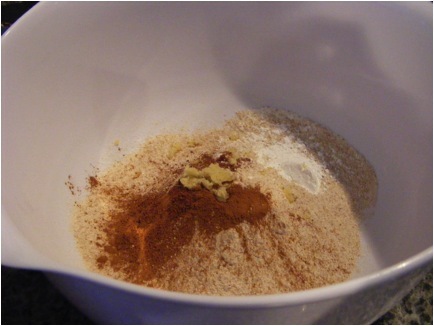 I mixed my dry ingredients — whole wheat pastry flour, baking powder, a dash of salt, cinnamon, nutmeg, and ground ginger. 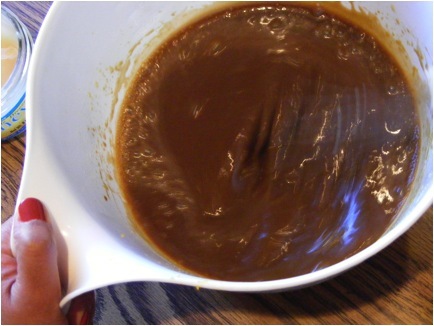 I sweetened the “wet” ingredients using honey and molasses, (but if you don’t eat honey, you can use agave or sweetener of your choice!). 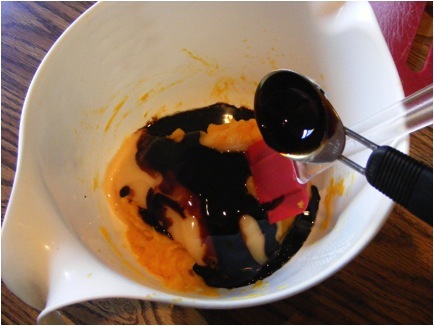 The bowl of wet ingredients contained puréed butternut squash, almond milk, honey and molasses. In retrospect, I wouldn’t have been mad at some vanilla being added to this mix. Voilà! Cooled, topped with walnuts and ready to savor. 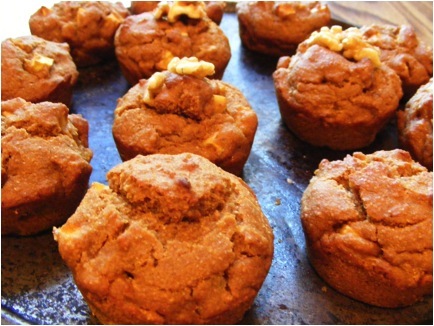 The muffins were hearty and nutritious and sweetened naturally and conservatively. Definitely to be enjoyed in good conscious, and easily manipulated to be made gluten free. Or, if you find them a bit too “crunchy granola,” to be made a bit sweeter and more dessert like. Either way, enjoyed. My muffins were inspired by The Post Punk Kitchen’s recipe for The Best Pumpkin Muffins, but I obviously subbed pumpkin for butternut, and added apples. I’m a badass in the kitchen that way. 1. 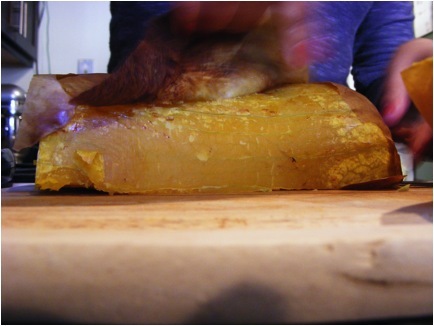 First, roast your squash. 2. Turn your oven back on. This time, heat it up to 400 degrees. 3. 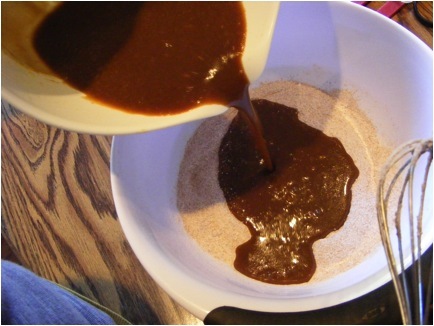 In a large bowl, combine flour, baking powder, salt and spices. 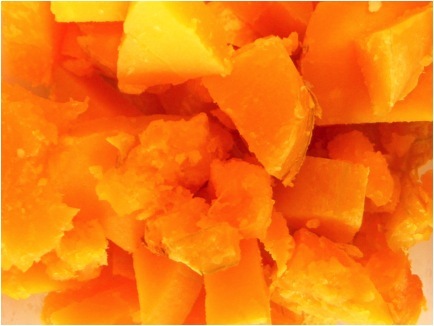 In a separate bowl, whisk together prepared butternut squash, almond milk, oil, honey and molasses. Pour wet ingredients into dry. 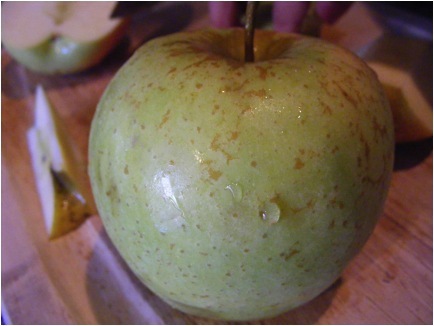 Add diced apple. Mix. 4. 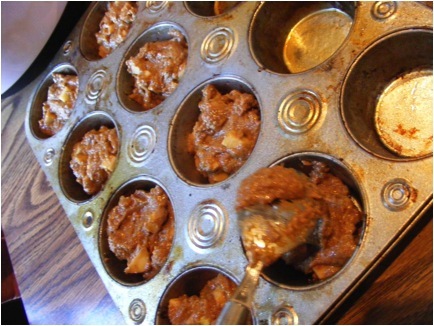 Grease muffin tins with a little additional oil and fill them about 2/3 of the way full. Bake about 20 minutes, or until a knife inserted into the center of a muffin comes out clean. Arv! Thank you so much for sharing your words, photos, and food! You’re the best! Ooo, I bet almond flour would be great! We had some great times! <3 Thanks again! Pingback: Roasted Buttnernut Squash Salad with Lemon Tahini Dressing | .the rebel grrrl kitchen.